We have just updated all of our software tools so that they no longer require administrator privileges to run. No more unwanted User Account Control prompts! I’m going to explain why we used to require administrator privileges, why we’ve removed that requirement and what impacts that has for you the user of the software. If you’ve ever used our tools on Windows Vista, Windows 7 or Windows 8 you’ll know that our tools required Administrator privileges to run. Because of this each time you start the software you are faced with a User Account Control dialog. There is a pause, the screen darkens and then the User Account Control dialog is displayed. You can’t do anything other than interact with this dialog. It’s a “Yes I want to run this. No I don’t want to run this.” deal. But of course you want to run this software, you just started it. Hal really should open the pod bay doors. This gets even more frustrating if you’ve used our command line interface to automate your testing or if you need the software under test to run without administrator privileges. The ideal scenario would be for the software to run without requiring administrator privileges, just like most applications on your computer. This would improve the usability of the software, make automated testing smoother and just be better all around. 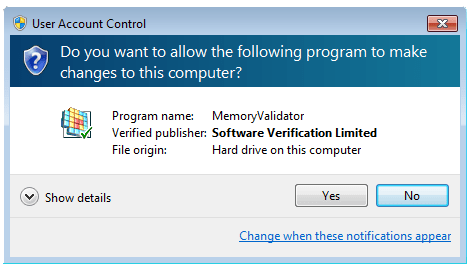 A User Account Control dialog is displayed, interrupting the user’s flow. Automated tests require someone present to approve each tests’s run because a User Account Control dialog is displayed. This either partially or completely defeats the purpose of automating the tests. The software under test is now run with Administrator privileges. For most applications that isn’t an issue but for some applications this is not the correct privilege level for that application to run at. The first issue isn’t ideal and adds frustration to the user’s life. The second issue is horrible. The third issue is a deal breaker for the few people that must test their application’s at a specific privilege level. As you can see we had to change this state of affairs. When running the software without administrator privileges the only thing you’ll notice is no administrator privileges. You can launch and monitor applications without administrator privileges. You can also monitor services that are linked to the NT Service API associated with the tool without administrator privileges. Only the Inject into Application and Wait For Application functionality (C++ tools only) prompt you for administrator privileges. Other than that the software works the same as usual. If you run the software without administrator privileges the software will communicate with SVLAdminServiceX86 or SVLAdminServiceX64 as appropriate. The service will do the work required. The C++ tools now work with desktop application, services running on LocalSystem account and services running on LocalService account. You can still right click the software and run the software with administrator privileges. If you choose this the software will behave exactly as it did in the previous release, it will do all the actions itself and not ask the SVL Admin Service to do the work. If you want to Inject into a running process or Wait for an application to start we can still do that with the C++ tools but you will need to run with administrator privileges to do that. This is principally because CreateRemoteThread from a service doesn’t work when the target application is not running in the same Windows session. This is a Windows security improvement. Until we can provide a workaround for this these two activities require administrator privileges. The software will automatically prompt you for this process elevation. Similarly if you launch an application using CreateProcess (the recommended method) you don’t need administrator privileges. But if you choose any of the other options you will be prompted for administrator privileges. Why did we require administrator privileges? Our software tools are dynamic analysis tools that analyse the behaviour of software at runtime. As such our tools use a variety of techniques to invade the user space of the software under test and to communicate the collected data back to the user interface. If the software is a desktop application then different security environments are in force compared to if the software is a service. When dealing with a service such as Internet Information Server then you are dealing with a very locked down process. Some of these processes are very hard to interact with. You may be able to inject into the process but then not communicate with the user interface. To cope with this early versions of our software simply used global shared memory (prefix the shared memory name with \Global) and ran with appropriate debug security privileges. This worked really well. Then came Vista with the new security regime. I’m sorry to say that our initial response was lazy. We simply put admin privileges on everything as a temporary workaround until we could get around to fixing things so they’d work without admin privileges. So what happened? We got side tracked. We spent a lot of time focussing on other things, supporting different operating systems, different Visual Studio, porting the software to 64 bit, floating licences, improving the UX of tools like C++ Coverage Validator. And because we were at the time developing on Windows XP x64 we didn’t feel the pain of using the new security regime all the time. We’d use Windows 7 for our email machines, personal laptops and for testing but not for daily development. Why were we using Windows XP x64? The answer is simple. 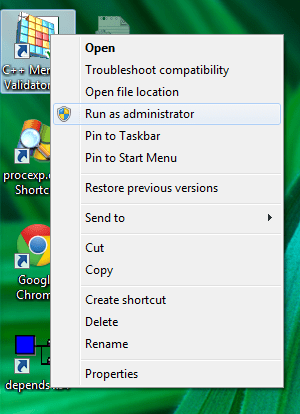 The compressed start menu on Windows 7 is harder to use than the flyout menu on Windows XP. The search functionality on Windows XP is so much easier to use than that built into Windows 7, especially if you are searching for words inside a document (think Visual Studio project, manifest, source code, etc). Yes I know Windows 7 search has great power built into it, but it’s slow, hard to use as it’s crammed into one tiny window and in my experience often doesn’t work. Whereas the Windows XP search experience is simple, easy, reliable and fast (three fields, file name, content to search for, where to search). Sadly Microsoft has made search on Windows 8 even worse (right click on a search result and if you open the location you lose the search results – how is that useful?). And of course the start menu has gone. Anyway, as the end date for Windows XP support, April 8th, loomed we started getting queries about our software that we’d never fielded before. Most were related to the User Account Control issues already described. People who had been using Windows XP and Windows XP x64 for development were abandoning ship, moving to Windows 7 or Windows 8. By the time we got to the start of March I knew we had to drop everything we were doing, annoy some of our existing customers by putting certain work on hold, and make our software run without administrator privileges. No User Account Dialogs! Usually we issue one or two software releases per week. Or maybe one every two weeks. Our last software release was March 19th, over 10 weeks ago. This has been the longest break between software releases we’ve ever had. The scope of the work has been huge. We’ve had to write a service that the software talks to to do anything that would normally require administrator privileges. Then we had to identify every area that was impacted by the change in privilege levels. This meant some areas of the software had to be completely re-written. For example our Registry handling software now also has to be able to write to files and memory so that we can pass that data to the service so that the service can populate certains parts of the Registry on behalf of the software tool. Another area that has changed is shared memory. You can no longer just prefix everything with \Global and expect it to work. As such shared memory handling has had to change. This is particularly important if you are working with services. Copying files to certain locations is no longer possible. Writing files to certain locations is no longer possible. All these things we’ve had to address. We’ve had to update the installers to correctly install the service (and uninstall it first if we’re replacing it with an updated version). We’ve had to test on Windows XP, Windows x64 (to ensure our XP customers still get the experience they expect) and on Windows 7 and Windows 7 x64, Windows 8 to ensure everything works correctly. The different security handling for services between XP and Windows 7/8 causes some interesting problems to be worked around. We’ve tested everything to bits. And along the way we’ve re-factored some of our software and also exposed and fixed some low level bugs in our hooking software (some of which are a side effect of recent optimisations in the way Microsoft build their operating system DLLs). Error reporting on the Diagnostic tab has improved. You might think we weren’t dog-fooding. That is, using our own software to test our software. Yes, we do use our own tools. But we were not using our tools in an environment that would cause these issues to be apparent to us. We had chosen to eat at our favourite restaurant rather than at the best restaurant in town. Having just spent two weeks on a cruise ship this analogy is sound, we quickly concluded that we preferred the Bistro over the fancy restaurant. In fact we had deliberately chosen Windows XP x64 because we found it easier to use for the reasons already stated. In hindsight, although this was a good choice for ease of development it was a poor choice from the point of view of experiencing what the bleeding edge of our customers use. Our current development environment is Windows 7 but we’ll be moving to Windows 8 as soon as the new machines arrive. For Windows 8 we’ll be adding the Stardock Start8 Start menu. We’ve also written some search tools that although crude, allow us to search files more easily than using Windows 8 built in search functionality. We’re writing more tools to make our development work easier, even as Microsoft’s own UX efforts make what we want to do harder. The move from administrator privileges required has been a time consuming, challenging experience. We’ve learned a lot along the way and had to change how our software works. However the result is that you, our customers, the users of our software now have an easier time using the software. I hope you agree the effort was worth it. Over on the MSDN blog there is a series of articles about Windows 8. Among those articles are three articles about the Windows 8 Start Screen which replaces the Start Menu. I’ve been a member of MSDN since late 1994 when I first heard about MSJ magazine and then heard about MSDN. I’ve worked with Microsoft technologies for the vast majority of the time since then and pretty much exclusively since 1998. I’ve hated the backwards steps the Start menu took from Windows XP to Windows Vista/7 but the Windows 8 process – well that is such a change that I think this will debut so badly that this will be worse than the reception Vista received. The Vista machines we purchased we got rid of. We have Vista as virtual machines only. We do like Windows 7 though. That works. So far, despite repeated trials of Windows 8, all I can say is that it is awful. It is not productive, not for how we work. I don’t care how good it is at touch or how well it does web related home-consumer tasks. None of that helps me be productive in my day job. That is what counts. It is, more importantly, also what counts for my customers. I want Windows 8 to be a success. That is why I am pushing back so hard against the Windows 8 start screen. The first article Evolving the Start menu explains what they did and why they did it. It received a lot of negative criticism. They followed up with a second article Designing the Start screen which completely ignored all the criticism and tried to steamroller the Start Screen as superb. This duly received a lot of further criticism. There is now a third article Reflecting your comments on the Start screen which is full of information, insights and analysis on how they came to arrive at the Start screen and why they think the Start menu should go away. The problem is the arguments are not convincing. The first argument is that the Start menu is inefficient. That it requires dextrous control of the mouse to find and select an item (this is true) and that it is slow to do so (also, reasonably true). Therefore they introduce the start screen which is a 2 dimensional grid of tiles that you can easily find with your mouse etc. The problem is, this is not true. They boast that on screens of 1900 x 1080 resolution you can have 80 tiles. I have a screen of 1900 x 1200 and it has 72 icons on the desktop. Can I easily find the icon I want to launch a program? Yes, sometimes. But most of the time I have to scan the whole thing to find the one I want. And I organised that group of icons. It is not efficient. Sometimes despite knowing what I want is in my list of 72 icons I can’t find it and I give up and go and find it from the Search menu anyway. And Microsoft want all of us to work this way in future. Yikes! The old Start menu had a search function on it. In Windows 2000 and Windows XP this was really efficient – you could tell it where to search, what to look for in a document all before starting the search. No time wasted. In Windows Vista and Windows 7 this was awful, very inefficient. You had to start a search you knew would fail, then bring up the search widget, choose custom and flail around in that awful user interface then get the search (with no progress indicator showing which directory was getting searched – we had that in W2K and XP). The new Windows 8 search function – there isn’t one. Wait, there is. Just its invisible. Which is why I didn’t know it exists. Its that discoverable that an MSDN member of 17 years could not find it. Yes, I know I know, I must be an old fart, but seriously. If I can’t find it can my parents, can my girlfriend, can the people working in the Vetinary surgery down the road? No they can’t. To use search in Windows 8 you have to switch to the start screen and then type. That’s right type into nothing, just type. Apparently this nonesense is inspired from mobile phones. Thats great. Except it isn’t. I’m happy with that metaphor on a phone. But I want my PC to behave like a PC. What is efficient for one device is not efficient for another. If that were true we’d control aircraft the same way we control submarines. Unsurprisingly we don’t. Furthermore when you switch to the Start menu to make your search you lose the context of your work – so god help you if were hoping to read some text from a website or a document to type into the search widget. How efficient is that? They just made you add an extra step – you now have to copy and paste the text from the website or document. What? The text isn’t copy and pastable? Oh dear, no you’ve got to copy the text off the document onto some paper, switch to the Start screen and then type what you’ve written on paper into the invisible search widget. Sound exaggerated? Perhaps. But I can see this happening. Especially with less au-fait users like the aforementioned people at the Vetinary surgery (I am actually thinking of some people I know – good with animals, not so with computers – just things to use, on the Desktop!). You don’t know what you’re looking for? So how will you know when you find it? Well, I can kind of remember its name, but not really, but I’ll know it when I see it. Its like being in a library in the philosophy section and you’re not sure what you’re looking for then all of a sudden you hit the section of Thoreau books and out pops the one you’re looking for. How could I have forgotten its name? Silly me. Well indeed. And its the same with programs. Often I can’t remember who wrote it (so I can’t select by Vendor) or what its exact name is. My developer machine has 94 menus on the Programs section and most of those have submenus with between 5 and 10 items on. Some have more and some have more submenus. That is a lot of program names to rememeber. Unsurprisingly I don’t rememeber them. I have better things to devote my memory to. But I can browse those menus relatively easily and with reasonable speed. The main reason I can do that, browse between 450 and 900 items is because each menu only exposes the data under it when I look at it. If I had to look at all 450-900 items at once it would impossible. Most of the items I never look at the submenus, I just have to read the main menu entry and then move on or occasionally check the contents. It is an efficient compromise between having to use search to search for all executables and then dig through the ridiculous number of results (very slow) and the other extreme where I have to remember them all. The problem with Windows 8 is that there is no Start menu to browse. I have to use search to find what I want. How can I find what I want when I don’t know its name? Answers on a postcard please (or leave them in the comments section). A few of the comments in support of Metro in the MSDN blog comments indicate that the poster of these comments thinks that people with views like mine are dinosaurs that can’t see the value of having updating live tiles. What a limited and narrow view. Such live tiles were previewed in Vista with the gadgets on the screen. Sure they are useful. I haven’t said they are not useful. I have said I don’t wish to work that way. These are different concerns just as some people wish to drive manual cars and others don’t want that chore so they choose an automatic car. In fact that is not a bad analogy, Metro would be the automatic car (less control) and Start Menu users would be driving a manual car (more control). I have no need for an email tile keeping me up to date with my email. Why? Because I work with 2 computers and three screens. One computer is dedicated to handling email and browsing the web. The other one is for development work. The email machine has an email browser open all the time. Even if I had one machine I’d have the email client open all the time. An email tile is a waste of CPU time for me. Also, if you know anything about productivity the last thing you want is a screenful of animated tiles doing their thing in your peripheral vision. Nice eye candy for the easily impressed. Boring annoyance for those of us that want to get stuff done. Linux? Who cares about Linux? Why suddenly talk about Linux? Well they’ve already done this particular experiment for you. The most recent release of Ubuntu comes with the Ubuntu One interface as the default. This is a user interface that makes you access everything via tiles (admittedly more restricted than Metro) and forces you to work with single screen applications. I first tried it on my netbook. My initial thoughts were that it was good. Web browser and email clients come up full screen (all 800×600 of it!) and I could browse the web OK.
Then a few weeks later I thought I’d install Ruby On Rails on it and take a toy project away with me for a bit of tinkering while on a break. What a disaster. Totally impossible to get anything done in these single whole-screen environments. I spent a good deal of my time in the task switcher moving one window to the front, finding another, then moving that to the front and so on. That installation of Ubuntu got replaced with the standard Ubuntu classic and all future installations are setup deliberately to exlude Ubuntu One. If you read around the web you’ll find lots of power users also hate Ubuntu One. Just like the power users complaining on the MSDN blog about Metro. You’re taking control (and thus productivity) away from your best customers. The Windows 8 Start Screen covers all your screens. Not user friendly at all. Completely stops any context. As far as I am concerned losing even one whole screen is way too much, especially when you consider how efficient and non-context losing the start menu is. If the start screen could be encompassed in a resizable window so you could move it whereever you want, or minimize it out of the way that would be useful. This in addition of course, to actually having a proper functioning start menu. Many complaints have been made about the inability to kill tasks in the Metro interface (all you can do is suspend them). Also the lack of support for multi-tasking windows is a real productivity killer. These complaints remain un-addressed by the Windows 8 developer team. The Windows 8 developer team seem completely unconcerned that those of us that want to use their PC to do work do not wish to work in a fashion that is dictated by the needs and desires of those whose only use for a PC is to consume the web/youtube/facebook/email on their tablet or gaming PC. Both groups of people can be accomodated. Business users. Leave our Windows Desktop alone and give us the Start menu we know and love. Home users. By all means give them the tablet UI you have designed Metro for. Why can’t this be a configurable option? A powerful Start menu option for folks like myself and the Metro interface for people that think search is a useful replacement for the Start menu. The user experience that I have had with Windows 8 Developer Preview has been extremely poor. Open source operating systems like Haiku give you a better experience out of the box. I really do wonder if the Windows 8 Developer team is using Windows 8 to develop Windows 8. And I mean everyone, the management team, everyone that has to use office, powerpoint, email, MS Project, all the development team, including people using WinDbg and Visual Studio. I can’t believe they are because the loss in productivity would be huge. I have to conclude the only people eating the Windows 8 dog food are the home consumer testing group that want a tablet/phone/home-user user interface. I hope that having read this far you realise that the problem with Windows 8 Start Screen is not the start screen itself. It is the drop in productivity and the horrible context switch from Desktop to Start Screen (which itself is a productivity issue) that are the issues. We know what is productive for us. And, although you think you know best for us Microsoft, you don’t. I’ve already experienced Windows Vista/7 search and hate it. I don’t want to have to use Windows 8 search even more than I already have to use Windows 7 search. Keep search as what it is good for and allow me to browse for my files, productively, using the Start menu. I hope that when Windows 8 finally debuts people can look back at this article and think “Thank God, it didn’t happen, Windows 8 is still productive”. Otherwise we’ll all be walking around in T-Shirts with the slogan “Windows 8 #fail”.